We focus on different activities while we wait for spring's arrival. Gone are those glorious days of September and October, ideal for getting stuff done around the garden, with temperatures perfect for sleeping afterwards. Now, there's nothing blooming in the garden, plants have dropped their leaves, and daylight disappears before supper. As one of those miserably affected by the disappearing of daylight and who regards winter with about as much enthusiasm as a trip to the dentist, I have to work hard at focusing on the good aspects of the fourth gardening season. Fortunately, I'm also a "glass-half-full" kind of person who can find positive aspects to almost anything. Here are my suggestions for keeping your thumb green during late autumn and winter. Admittedly, that's one of those trendy garden terms, but it actually has merit to it. If you look out at your garden on a dreary midwinter day and see nothing but snow, or grey lawn and a few skeletal trees, that's not too interesting. But if you've planned your garden to have four-season appeal, there's always something to look at, even when the season doesn't invite hands-on activity. 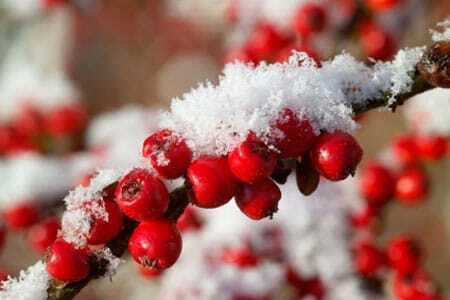 Plants that provide winter interest may have eye-catching shapes, intriguing bark texture, colourful foliage, or long-lasting seeds or berries. Conifers and broadleaf evergreens with gold, blue or variegated foliage are attractive against a backdrop of snow and brighten even dreary days. Many native plants such as winterberry, witherod, wild cranberry and indigenous conifers are especially valuable for winter interest, and have the added bonus of being well suited to the vagaries of our climate. Those that produce seeds or fruit provide food for overwintering birds and other wildlife, adding an extra element of interest to your garden environment. Structures such as rock walls, arbours, birdfeeders, benches and sculptures look appealing and unique when sheathed in ice or dusted with snow.